Electrons are once again streaming into SLAC’s historic End Station A, setting the stage for a new user facility in the huge, concrete hall where the first evidence for quarks was discovered. R&D for high-energy physics detectors, which will use secondary particles created when the main beam hits a target. Carsten Hast (pictured above), head of the Accelerator Research Division’s Test Facilities Department, said recent renovations and new equipment have been successfully tested. The first experiment, which will be carried out by SLAC researchers as part of the commissioning process, is being installed this week, and the first outside users are expected to arrive in about a month. End Station A (pictured right) is one of two historic experimental halls at SLAC in Menlo Park. Opened in 1966, it initially hosted experiments in which particles were slammed into fixed targets to see what came out. More recently End Station A has been used for testing scientific equipment, including the ANITA detector, headed for the South Pole, that required a 10-ton block of ice to create the right environment. The linac upstream of End Station A feeds the LCLS X-ray laser, providing rapid-fire electron bunches that are used to generate X-rays. But in 2009, several accelerator physicists got the idea to divert some of the electron bunches from the linac into the end station without disrupting LCLS operations. Work on the new user facility began in 2010. Crews installed two “kicker magnets” that grab electron bunches from the linac and bend them through a 24-degree left turn into a long metal pipe leading to the ESTB users’ experiments. 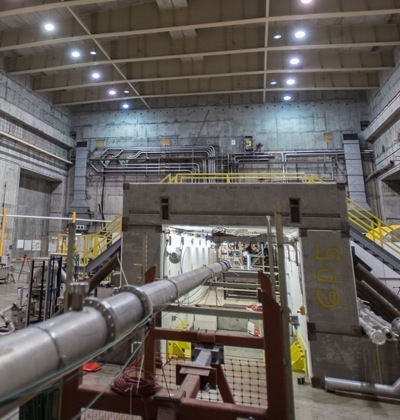 A massive steel-and-concrete “beam dump” safely stops and absorbs high-energy particles after they pass through the experimental area, and a new personnel protection system safeguards users and staff. When fully operational, the test station will host about 20-30 experiments per year. The ESTB’s electron bunches can also be smashed into either a copper or phosphor-coated aluminum screen, which creates showers of lower-energy “secondary” electrons that can be sliced, diced and collimated in energy and number by slits and apertures according to the experimenter’s needs – even down to producing single electrons at various energies that are used in detector R&D. Hast said the ESTB team is now making a cookbook-like guide to tell the linac operators how to create the specific electron energies and pulse durations the users will need. Still to come: additional optics for handling a wider range of electron energies.